Hearing about the White Horses, I remenber those cut on the hillside of the chark downs of Oxfordshire and Wiltshire at first. To my surprise, there was one in this Yorkshire, too. It was "the White Horse of Kilburn". Some of the White Horses are very old and said to have their origins in the ages of the Celts or the Anglo-Saxons. But after the 18th century, various figures were cut following the ancient people's way. 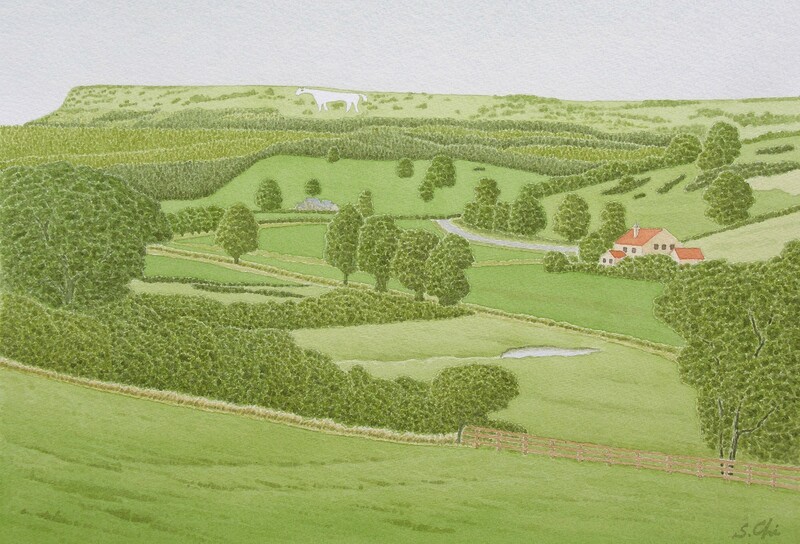 The White Horse of Kilburn, on the face of Roulston Scar, the slope below the south edge of Sutton Bank Top, is one of them, which is the only "white horse" in the north of England. The story all began when one Thomas Taylor, a salesman from Kilburn, dealing with Yorkshire ham and bacon in London, saw the White Horse of Uffington. Books say that he saw it when he visited Berkshire. (But the white horse is situated in Oxfordshire not in Berkshire.) Anyway, as he was so impressed by it, he wanted to have such a horse in his home village. He thought the face of Roulston Scar above Kilburn was an ideal location to cut the horse. When he came back to Kilburn, he told it to the village schoolmaster Thomas Hodgson. The schoolmaster soon drew a plan and started to work with the help of some villagers and pupils. In November in 1857, the White Horse of Kilburn, having long body of 314 feet in length and 228 feet in height with a big eye, was completed. It is said the villagers celebrated the birth of the white horse with two roasted bulls and more than a hundred gallons of beer. Taking care of the Wihite Horse has been hard work. As the horse was not created on a chalk bed but made of whitewash and chalk chippings, it easily cracked and fell down during years. That made the horse a pitifully deformed grey horse, which needed to be repaired. The horse is now overlaided with white cement with chalk chippings and it has become one of the landmarkes of Yorkshire, visible from as far away as Harrogate and Leeds on clear days.